Here is another model in the growing range of Leonardo da Vinci designs, a 1:12 scale (or thereabouts) kit originated by Academy in South Korea, but made and marketed in Europe by the Italian firm Italeri. 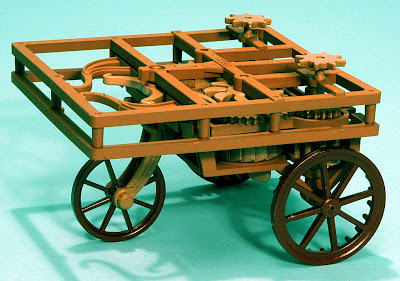 The kit models Leonardo’s idea for a mechanical self-propelled cart, which would be, I suppose - if it had ever been built - the first example of a perfectly feasible ‘automobile’, predating Karl Benz’s three-wheeler by some 400 years. 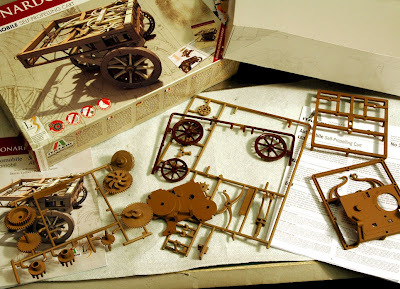 The kit is moulded mostly in conventional plastic, though there is, in common with all this manufacturer’s Leonardo kits, a pre-assembled clockwork motor supplied to power the completed model. 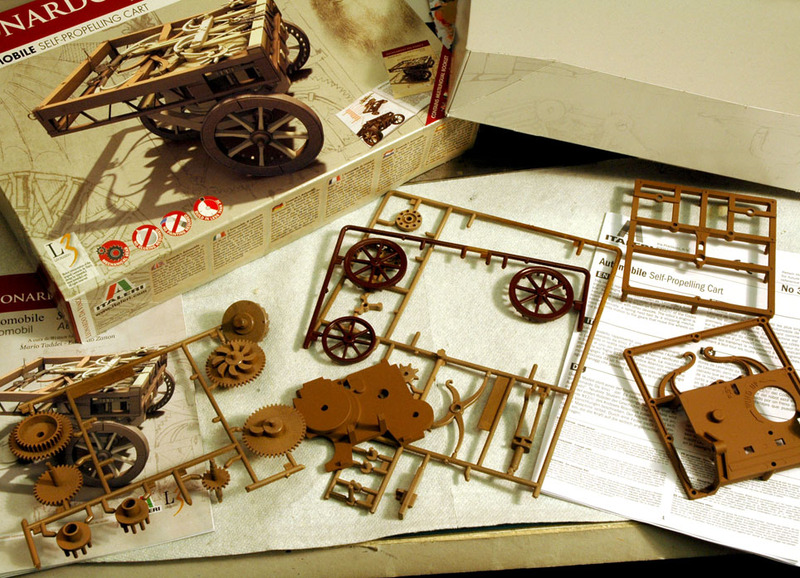 The components are pre-coloured in various shades of brown, though a coat of paint - wood or tan, or similar - could be applied. However, if you want your cart to work properly, the areas where parts move against others will have to be monitored carefully. The solution for smooth running is to either mask parts so that paint doesn’t get on them in the first place, or to make sure that paint on affected areas is carefully scraped off before final assembly. 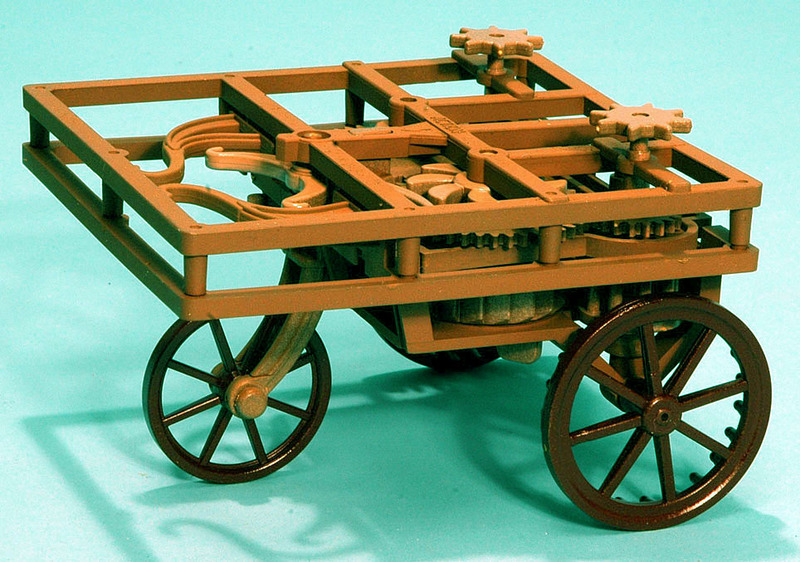 The self-propelled cart is a simple kit of some 25 plastic components, a couple made of metal, plus the pre-assembled clockwork motor. The scale is a bit problematic, but - assuming the design was intended to be built at full-size - my best estimate is you are looking at about 1:12 scale, even though Leonardo didn't include any seats in his design, which would allow a more accurate scale guesstimate. 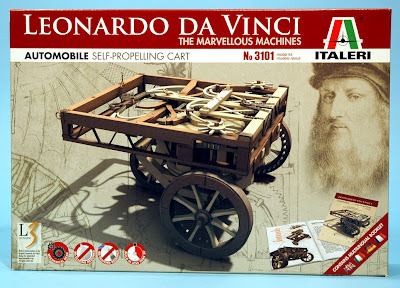 1 The box for Italeri’s version of the Academy Leonardo da Vinci Self Propelled Cart, here prefaced with the word ‘automobile’. 2 Some of the main parts for the Cart. 4 A detailed booklet comes with all these kits, giving details of the thinking behind Leonardo’ s various ideas, plus museum and CGI images, and a list of other references. 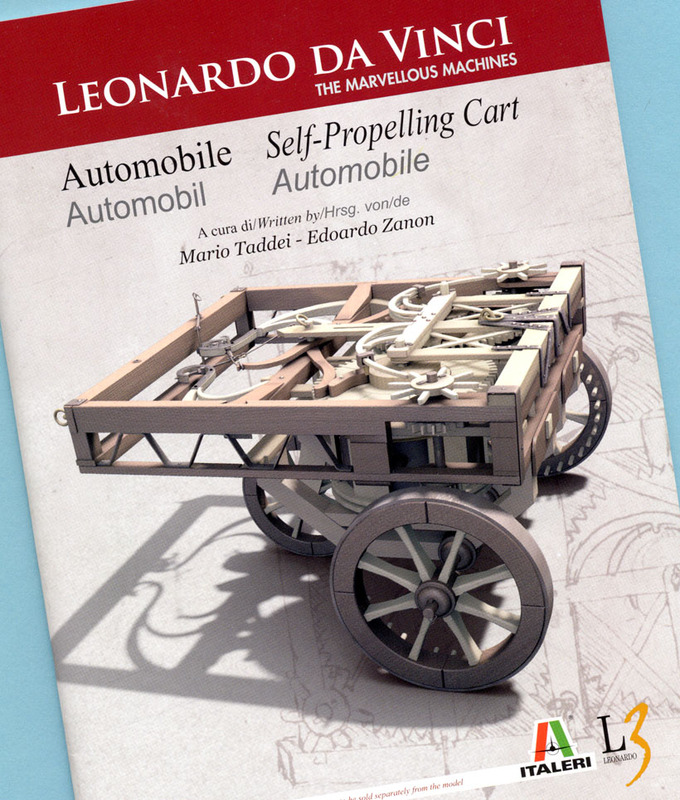 See the Cart and other Leonardo devices here.